(JTA) – It’s rare enough for a Jewish baseball player to make it to the major leagues. A New York Jew named Moe Berg took it even a step further – he added war spy to his extraordinary resume. Berg pulled off the feat over 60 years ago. As a catcher in the majors for 15 seasons during the 1920s and ‘30s, he was known more for his intelligence and introverted personality – famed manager Casey Stengel once called him the “strangest man ever to play baseball” – than his athletic skills. He read several newspapers each day, spoke more than 10 languages (seven fluently) and graduated from Princeton at a time when Jews normally weren’t admitted. During World War II, after his baseball career, Berg worked for the U.S. government and eventually rose to a position in the Office of Strategic Services, or OSS – a precursor to the CIA. He went on missions in then-Yugoslavia, where he tracked resistance groups, and Italy, where he interviewed physicists about the German nuclear program. 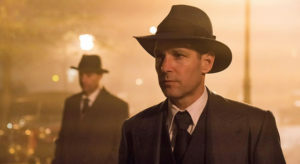 The story sounds like great fodder for a movie, and that’s what it has become: “The Catcher Was a Spy,” based on a 1994 biography of the same name by Nicholas Dawidoff, opens Friday in theaters. Paul Rudd (who happens to be Jewish) stars as Berg alongside Mark Strong and Sienna Miller. The film begins in 1939, his last season as a player, with the Boston Red Sox, before picking up several years later when Berg has a boring desk job at the OSS. His boss, Gen. William Donovan (played by Jeff Daniels), eventually assigns him a mission in the field, and with Sam Goudsmit (Paul Giamatti), Berg helps rescue the Italian physicist Eduardo Amaldi from the Nazis. A more crucial assignment is to kill the famous German physicist Werner Heisenberg, a task with which Berg is not completely comfortable. There is no certainty that Germany has the resources to build a bomb (the Brits don’t believe they do) or even that Heisenberg, despite being a loyal German, will help them build a weapon of mass destruction. But Donovan decides not to take a chance and orders the hit. As a whole, though, the movie falls in a bland area between truth and fiction. While Berg’s missions are fascinating on paper, the content isn’t particularly cinematic, the way a good James Bond film is. So while the end product stays honest to the facts, it sacrifices some enjoyment for the viewer. Lewin, 71, the son of Polish Holocaust survivors, migrated with his family at a young age to Australia, where he grew up in an observant Jewish household. He had never heard of Berg before the film opportunity arose and, though now Los Angeles-based, has never been to a baseball game other than his sons’ Little League contests. But he told JTA his Jewishness informs his “sense of connection with the subject matter.” In 1985, Lewin directed the award-winning “The Dunera Boys,” a miniseries about 2,000 English Jews who were somehow suspected of being Nazi spies and deported to Australia. In one scene late in “The Catcher Was a Spy,” Berg attends a Kol Nidre service at a Zurich synagogue during his mission to kill Heisenberg. While the film is based on true events, the Yom Kippur moment almost certainly never occurred. It was a conceit added by Lewin (even though Robert Rodat wrote the script). Lewin doesn’t know whether Berg actually attended services, but he finds it a plausible possibility.